Wave Skills Sailing School Ellen MacPhail operates an accredited on-the-water sailing school on SV Picture Perfect for the whole range of sailors from beginners to advanced skippers. Visit their website to learn more. 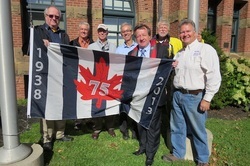 Blue Heron Power & Sail Squadron is a member of Canadian Power and Sail Squadrons (CPS-ECP). Visit their website to learn more about the courses they offer through the winter, ranging from courses for beginners to advanced open-ocean courses in Celestial Navigation and electronic charting.